One Control Croc Eye is a 10-loop programmable switcher, by connecting with One Control Crocodile Tail Loop OC10, is the attachment to significantly strengthen the MIDI functions of OC10. Using the supplied cable, to operate by simply connecting the LINK terminal of OC10, the power supply is required. OC10 is, you can send one program change message of the MIDI channel 0 per preset one, the use of Croc Eye, sending it to the In addition, 16 of the MIDI program change messages, and 16 MIDI Control Change messages It is possible. For it is also possible to call the preset of OC10 by an external MIDI equipment, expansion and MIDI control, you can do together the switching of the loop. In addition, Croc Eye can be set the preset name of up to preset one per three characters. In conjunction with the preset of OC10, you will be able to display a preset name to be easy to understand at a glance the current settings. This feature is for that can be used without being connected to the MIDI equipment, it can also be used as external expansion display. ※ in use Croc Eye is, it will not be able to link the two OC10. OC10 The body is connected to the compact effector of seven, three separate loops use in switching, such as amplifier. 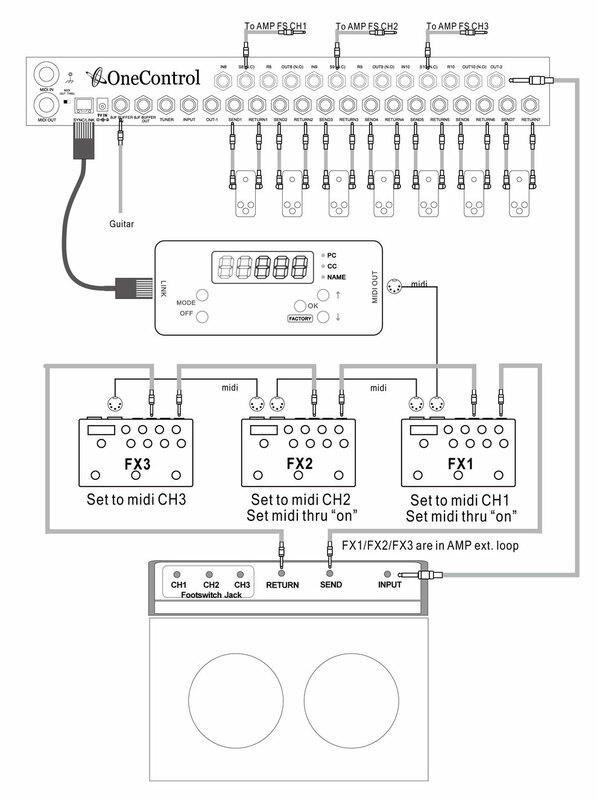 Three MIDI-compatible effector that is connected to the amplifier effects loop comes with a control and various settings and ON / OFF via MIDI. Thus, using Croc Eye, even MIDI compatible device that is not connected to the effects loop of OC10 body and can perform various control at the same time. Of course ON / OFF of MIDI-compatible effector is operated in a loop of OC10, and go other controls and the settings only in MIDI, you can also control the MIDI control correspondence of the amplifier. · Current consumption: 50mA max.